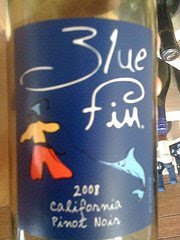 The Wellesley Wine Press: 2008 Blue Fin Pinot Noir: $3.99 of Goodness? The lack of a Pinot Noir offering has always been a surprising hole in the Charles Shaw lineup. But where do we turn for a decent Pinot when we want to limit our per-bottle spending to less than $5? Labels like Castle Rock, and Mark West are common plays when you really want to keep costs in check, but they tend to come in close to $10- many times more than a bottle of Shaw. Recently discovered wines like the suprisingly good 2008 RedTree California Pinot Noir can be had for as little as $6 if you shop around, but why on earth hasn't Fred Franzia's Bronco Wine Co. stepped up and offered a cheap Pinot? The answer to this question may have arrived in the form of Blue Fin Pinot Noir. Priced at $3.99 in California and Massachusetts, it gives Franzia a way to fill an end cap at Trader Joe's and test the $4 Pinot Noir price point without cannibalizing sales of their flagship Charles Shaw wines. A very simple, straightforward and drinkable wine. Mild strawberry and cherry aromas on the nose. Perhaps limited aromatically. Really tasty on the initial attack (with a surprising amount of flavor), but fades extremely quickly and is gone in a flash (both the finish and the bottle). An intriguing play at $3.99. Does this wine succeed in offering value? Not in a big way. According to the wwpQPR Calculator with a Baseline Price of $30 [ie, the price at which it isn't too hard to find an outstanding bottle of Pinot Noir] at 82 points and $4 we get a 1.18: Slightly above average. This wine is of below average quality in my opinion; it derives almost all of its value from it's incredibly low price compared to its category. Question of the Day: Will Fred Franzia's Bronco Wine Co. continue to offer Blue Fin as a way of nabbing an extra dollar or two per bottle for the hot Pinot Noir category [without introducing per-variety pricing variation to the Charles Shaw line]? Or, will they offer a Charles Shaw labeled Pinot Noir once their Pinot Noir production hits the levels needed to be pushed out the door of TJ's by the cartload?